Is Allah’s company concrete or spiritual? Allah,Glory be to Him, says, “And He is with you wheresoever ye may be” (HADID, 4), “..have no fear, for God is with us” (TAUBA, 40), “..for God is withyou” (MUHAMMAD, 35) “..God is with thosewho steadfastly persevere”, (BAQARA, 249), “..there is not a secret consultation between three, but He makes the fourth among them” (MUJADILA,7). The first group said that the company is general and all-inclusive as it embraces all creatures. Allah, Glory be to Him, accompanies everything with His Omniscience, His all-knowing Ability, His subduingPower and His all-pervading Sublimity; nothing can ever escape Him. Anothermeaning is Allah’s company to His Apostles and His chosen peoplethe Company that endows them with support, victory, love, attainment andinspiration. The second group said that the company of Allah is spiritual and it stands for knowledge, power, victory, and support. So, they agreed, with respect to this point with the members of the firstgroup. 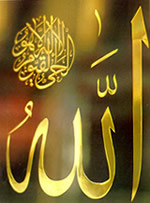 We find that the first group adheres to the literal surface meaning in some respects which they want to prove, then object to using the literal meaning by interpreting what they want; they considered the surface meaning of (the eye) and (the hand), but resorted to interpretation in the meaning of (Allah’s Company) and the criteria they used differed in many respects. On the other hand, the members of the second group tired themselves in interpreting Allah’s Company which may lead to arbitrariness. We should say that these verses and Hadiths are allegorical and we should not transgress our limits and delve in them so as not to be one of those whom Allah mentioned in the verse, “..but those in whose hearts is perversity follow the part thereof that is allegorical, seeking discord, and searching for its hidden meanings” (AL-I-‘IMRAN, 7); Allah decisively settles the matter and says, “..but no one knows its hidden meanings except God” (AL-I-‘IMRAN, 7). Thereupon, it is our duty to abandon interpretations as we have proved that it is impossible to take things in their literal and surface meaning; we have to believe in these verses as they are so as to be of those described in the verses, “..and those who are firmly grounded in knowledge say, we believe in the Book; the whole of it is from our Lord” (AL-I-‘IMRAN, 7); we should entrust our knowledge to Allah, Glory be to Him, without interpretation or analogy for it is impossible to compare Allah to any created thing as nothing resembles Him, Glory be to Him, He is Allah.